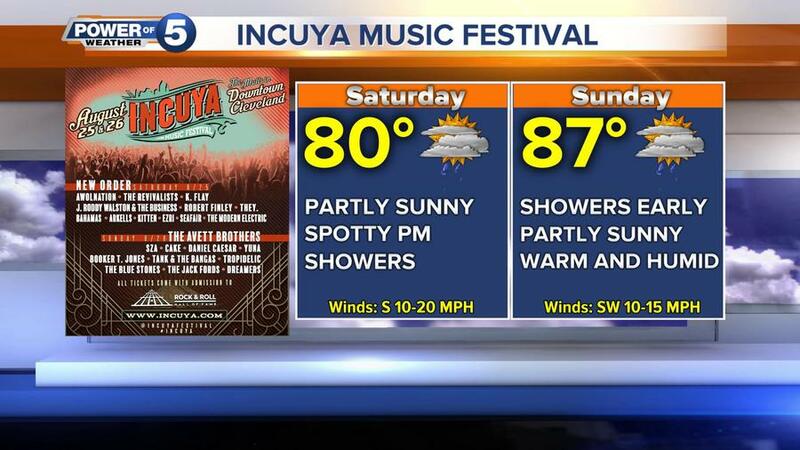 The highly-anticipated InCuya Music Festival begins Saturday in the mall areas of Downtown Cleveland. Here’s everything you need to know about how this large-scale festival may impact your weekend. Aug. 21 at 7 p.m. through Aug. 24 at 7 p.m. and Aug. 27 from 4 a.m. through Aug. 28 at 7 a.m.
Aug. 24 at 7 p.m. through Aug. 27 at 4 a.m. The music festival begins at 12 p.m. on Saturday, August 25 and at 1 p.m. on Sunday, August 26. Saturday’s headlining performer is English rock band New Order. Other performers on Saturday include Awolnation, The Revivalists, K. Flay, J. Roddy Walston & The Business, Robert Finley, THEY., Bahamas, Arkells, Kitten, Ezri, Seafair and The Modern Electric. The headlining performers on Sunday are The Avett Brothers. Other musicians performing Sunday include SZA, Cake, Daniel Caesar, Yuna, Booker T. Jones, Tank & The Bangas, Tropidelic, The Blue Stones, The Jack Fords and Dreamers. Click here for a full schedule of set times on both of the festival’s stages. The first half of Saturday will be dry, according to Power of 5 Meteorologist Bryan Shaw. The mid-afternoon will have the chance for a few showers and thunder showers. We see a break from the rain in the evening until the overnight. Spotty rain showers are again possible for the early part of Sunday but they clear up for the afternoon. Winds will be a little breezy for both days. It will be much hotter and more humid on Sunday with highs in the upper 80s. View the full forecast here. Tickets are still available. Tickets for general admission for the whole weekend currently start at $135. A four pack of tickets is currently $399. All tickets also come with admission to the Rock & Roll Hall of Fame valid from August 24 to 27. Single-day tickets are currently $85. Full ticket information, including details on VIP tickets and hotel packages, can be found here. Organizers recommend that attendees park near the Cleveland City Hall, the Cuyahoga County Courthouse, or any other downtown parking facility. LYFT is the rideshare partner for the festival, with dedicated drop-off and pick-up zones close to the festival’s entrance and exit. Attendees are free to enter and exit the festival at all times. For more details on the festival for attendees, including what is allowed and disallowed, information for those with disabilities and service animals, and more, click here.